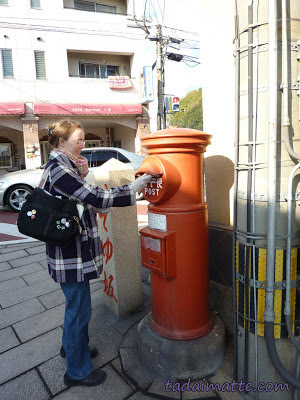 These traditional mailboxes can still be found around Japan. This one was in Beppu, Oita Prefecture. I've mentioned before how fun and interesting it is to take part in holiday traditions in Japan. During my first year in Osaka, as winter set in and Christmas decorations began to appear, so too did New Year's (oshougatsu) paraphernalia. For those unaware, New Year's is the biggest holiday in the nation, and loaded with customs very interesting to a visitor. Each New Year's, I took in a different type of celebration - once I did it traditionally, with ozouni and a shrine visit on January 1st, once in Tokyo at Aqua City Odaiba's shrine and osechi, and once in my own town with toshikoshi soba, watching the shrine next door burn its old offerings. 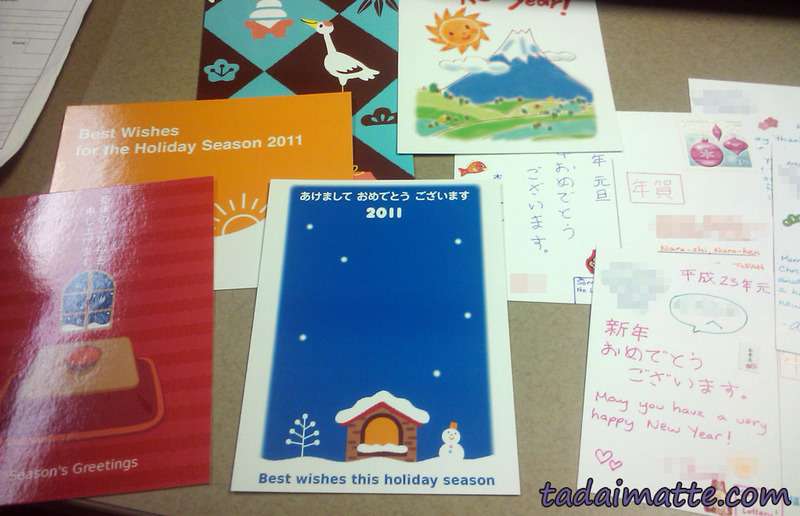 Every year, though, I sent the customary New Year's postcards, called nengajou (年賀状). These cards are sent out to friends, family and co-workers, and as long as you pop them in the mailbox by December 25th, they will arrive in mailboxes everywhere on exactly January 1st. There are markings on the card signalling to postal workers to keep the cards until New Year's; in fact, in my city, many mailboxes had one of their slots (usually there is a 'domestic' and an 'other' slot) entirely converted into nengajou drop-offs. I bumbled through my first year with some awkward store-bought cards, then moved onto making my own cards with special New Year's stamps. Before leaving for Japan, I did a Christmas card list, and it was a tedious venture with the amount of friends I included at the time. After moving back to Canada, though, I continued sending nengajou rather than switching back to Christmas cards. I tend to forget about keeping up with communication when you take Facebook and Twitter out of the equation, but I can at least make a commitment during the holidays to remind people I've fallen out of touch with that I'm thinking of them, and sending cards for New Year's is a little more unique than sending Christmas cards...plus, nobody wants to receive a Christmas card after December 25th, but New Year's cards can trickle in a little late with no repercussions during a rough holiday season. It helps when you're sending cards all over the world - my biggest batches go out to the U.S. and Canada, and some to Japan where there'll be held until January 1st as long as I get them in the mail early, but some also go out to the Netherlands, Venezuela, Germany and points beyond, where I can't control when they'll arrive. The time flexibility there is definitely great. Store-bought nengajou have lottery numbers on them which you can use (if you live in Japan) to win prizes. I never quite caught on to this when I lived abroad (admittedly, I sent far more cards than I ever received) but it's a great concept. Even homemade cards are often made using blanks from the post office with all the lottery information pre-printed. I feel a little bad that the cards I now send to Japanese friends have no lottery opportunities, but living in Canada restricts my opportunities to buy cards. Instead, I pick five or six of the free "make-your-own" templates Japan Post offers every year in November, and I have them printed up with a pre-printed address and 年賀 mark on the back, in the more traditional landscape-style design that we see on Western postcards. Looking over the designs for the year is a joy and writing out my messages and addresses for Japanese friends is a good way to practice handwriting skills. My first batch of template cards, in 2011. Not great examples of my handwriting, but this year's batch looks much better! Spreading this little bit of Japanese culture that many living outside the country wouldn't normally get to experience is great fun, and I love receiving postcards from my friends in Japan. I also like to think that when my co-workers back in Osaka receive a card from me, they feel a little better about the sort of revolving-door situation that is the unfortunate reality of ALTs in Japan, and know that I am still thinking of them, even years on.